Can Fathers Win Custody In Washington? Whether it’s right or wrong, there is a public perception when it comes to divorce and child custody, that wives, mothers, and women always have the upper hand. Proponents of this stance throw around all manner of statistics and expert opinions on the topic. On a practical level, many men feel that they are at a disadvantage in these areas and that their rights get trampled in the legal process. From the perspective of the law, mothers and fathers have identical rights. This means that each parent has the same claim to custody as the other. This is, of course, in an ideal world. We’re all aware that humans are fallible and subject to bias, and this includes judges. As such, things don’t always work out in reality as they should on paper. In child custody decisions, the court takes the best interests of the minor children involved into account, and the verdict will ideally reflect that. Historically, many have looked at mothers as the most nurturing, fittest parents, whether that is the situation or not. The preconception that children should always remain with the mother after the divorce, however, is changing. There has been an increased emphasis, both publicly and in the courts, on the importance of both parents remaining key figures in a child’s life after divorce or separation. This is hugely valuable for kids growing up. 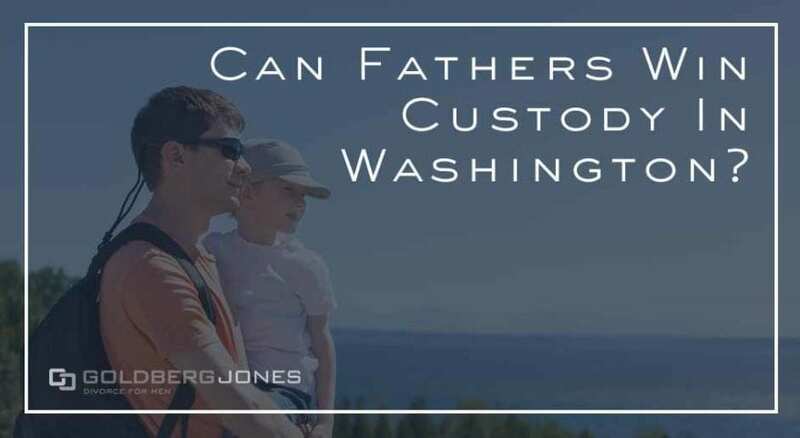 Though there has been more attention paid to it in recent years, the recognition of the role of fathers, and that fathers can also be the better parent, has legal roots in Washington dating back to the 1950s. In 1955, Washington couple Kathleen and Warren Johnson filed for divorce, which was granted in 1957—as you probably know, divorce can take quite a while. In the process, Warren was given custody of their son, Michael, then around seven-years-old. Unsatisfied with this state of affairs, Kathleen, who suffered from depression, subsequently filed a number of unsuccessful appeals attempting to regain custody of their boy. Ultimately, this case reached the Washington State Supreme Court in 1958. There the court once again examined the facts, looked at the situation in great depth, and upheld the earlier decisions. The question is why? The short answer is that once the court took into account all of the evidence, including witness testimony, it came to the conclusion that Warren was better suited be the primary guardian. Kathleen was, however, granted visitation. The decision was that the father retaining custody was truly in Michael’s best interest. Michael lived with Warren for three years previously, and in that time, he made the transition from being what the court called “distraught and maladjusted” to an “adjusted, normal child.” They cited the father’s stability and responsibility, as well as his “good moral character,” as positive influences on his son. He demonstrated deep devotion to the child and watchfulness over his well-being. Because of this, they determined he was the better of the two options, and the court consequently awarded him custody. Fighting for custody may seem like an uphill battle, and it may prove to be an uphill battle. But if you are the parent best suited to the job, you may have a strong chance to be awarded guardianship. In this case, the court recognized the demonstrable positive influence a good father can have on a child’s life and rewarded that accordingly. This decision also laid out a number of significant factors to be taken into account in future child custody cases. and that trial courts must be allowed broad discretion in these matters, factoring in ALL available information. We love our children. For many of us, our worlds revolve around them. This is a huge part of why custody disputes are so often such passionate, heated cases. Fathers have just as much stake in raising our children as mothers, and despite the popular conception, from a legal standpoint, have equal rights to be granted custody. Though there has been more recent emphasis and attention paid to the rights of fathers in child custody cases, and ensuring that they remain a part of your child’s life after divorce or separation, it can be a struggle. You will likely want to take an active role in this process. If your ultimate goal is to be awarded custody, you may have to fight for it, but an optimal outcome is very possible.